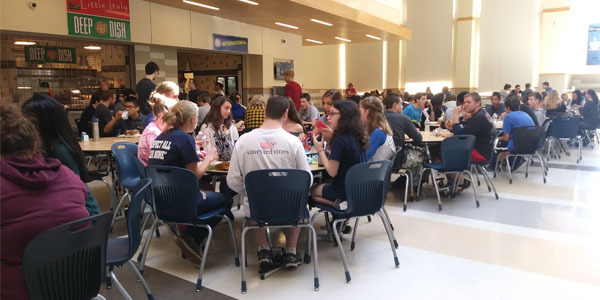 Franklin Matters: "constant crowding during certain lunches"
Anna Eppihimer, Pantherbook student, writes the latest on the cafeteria crowding at the high school. For the record, the State wanted the school sized for 1500, the town fought for and the high school was built for 1600. With almost 200 more students than it should have, it is not surprising to have some space issues. "This year, Franklin High School reached its highest enrollment in history. 1,792 students are currently enrolled, causing the lunchroom to overflow. The cafeteria isn’t as big as the school would have liked, and the administration, faculty, central office, superintendent, and student leadership are working on solutions to this crowding problem. Paul Peri, the principal at FHS, says he “recently ordered more lunchroom furniture.” He went on to say the new tables and chairs will be put into the main hall outside the lunchroom. Mr. Peri is also looking to get more high top tables for the main hall. The new furniture will alleviate some of the cafeteria crowding, and will provide a quieter area for students during their lunches."